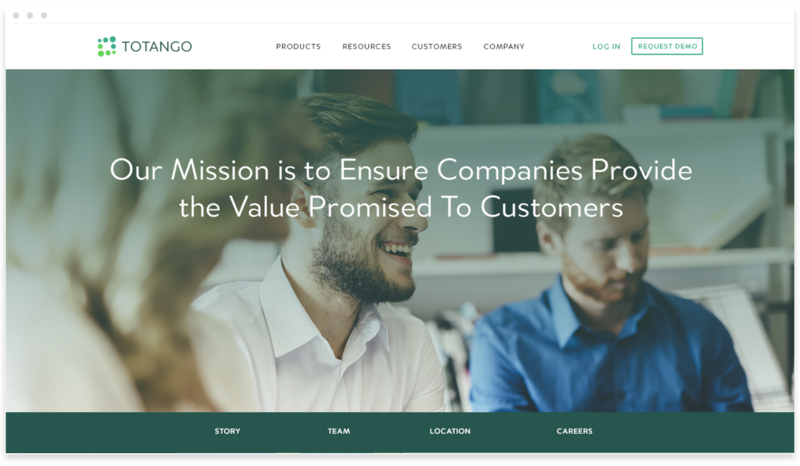 With a new redesign of the Totango brand, the company needed help revamping core landing pages on the site focused on its product, company, and careers. At Fundera, we believe that by educating small business owners in their financial decisions can lead to long-term success. This is the team's first attempt at empowering small business owners with free business and personal credit reports. Totango is a Customer Success software product that helps SaaS companies track customer health. Specifically, it helps pinpoint user flow errors to reduce customer churn, drive product adoption and advocacy, and maximize customer lifetime revenue. I was brought on to help bring the website together to meet the new brand core values: Trust, Authenticity, and Knowledge. Given its new brand direction, I focused on bringing the company's new visual guidelines around typography, illustration, photography, and colors to new cohesive landing page experiences. Starting with the Product page, we wanted to make it clear what Totango has to offer and what sets the company apart from its competitors. Next, we wanted to focus on what makes Totango the right choice for companies. The page uses a mix of photography, colors, and balancing Totango's accolades. The team wanted to ensure that it was clear what Totango's offerings were (Totango as a strategic partner and technological platform) while backing it up with case studies and recognition. A critical point for prospective applicants to evaluate not only what Totango has to offer to its clients but more importantly what Totango would be as an employer and what the potential long-term relationship with its employees would be like. We focused specifically on the hero image with employees to provide a stronger human connection. The page is rather simple to bring the user directly to job openings. It is more likely that a potential applicant would look to the About page for more context as to who Totango is. 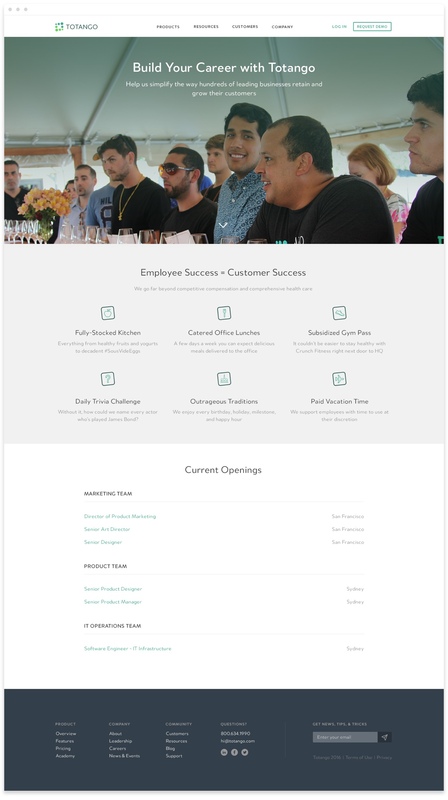 Lastly, to provide more context around Totango, we shifted our focus on the About Us page. The page begins with a brief story behind the company, followed by the leadership profiles. To highlight the global team, there are maps of the Silicon Valley and Silicon Wadi offices. To finish out the page, there is a fun photo of employees encouraging interested individuals to apply. The pages were launched in September 2016. As with many digital products, many changes have been made to improve the experience since my work with Totango. My hope is that this served as a strong starting point for the company to build a more cohesive brand language across its landing pages. While my day job is now focused on solving really complex product, UX, and conversion problems, I still find it so fascinating to switch my brain to work on projects focused on messaging. Whether that's finding the magical combination of words or building captivating visual compositions from branding components, I absolutely love doing it. I'm always looking for opportunities to continue exercising my visual design skills. Give me a shout if you're interested in collaborating.